One beautiful Fat Tuesday, my dear native New Orleanian friend, Kyle, invited me to take a walk a few blocks from Bourbon Street to the historic Tremé neighborhood, America’s oldest community of free black people, to catch a glimpse of a tradition that he described as “uniquely New Orleans but nothing like the booze and beads of the French Quarter.” Intrigued, I decided to take a stroll across Rampart Street to the Backstreet Cultural Museum at 1116 Henriette Delille Street. There, in the shadow of St. Augustine Church, the oldest African-American Catholic parish in the nation, we sat on the porch and enjoyed a spectacle beyond my wildest imagination! With a formal hierarchy of Big Chiefs, Spy Boys, Flag Boys, Wildmen, and others, the Indians graced the streets with drumming, tambourines, singing, call-and-response chanting, mock battles, and dancing. 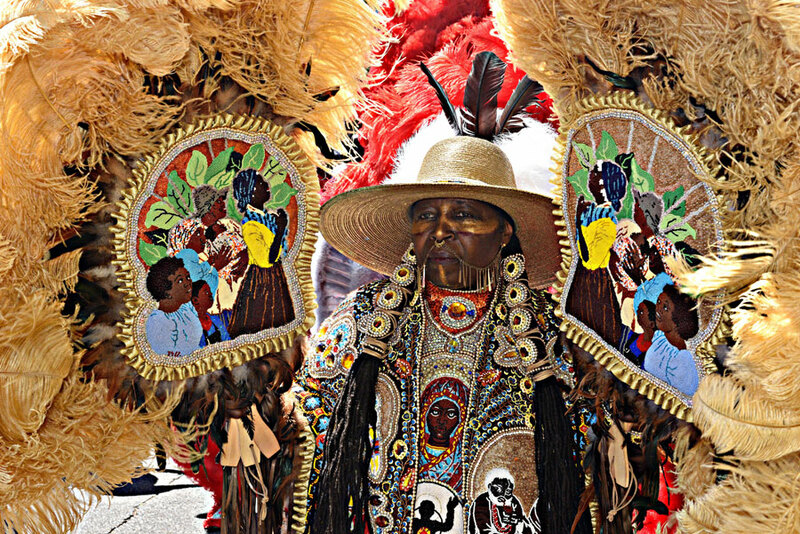 Kyle explained that there are around forty tribes of Mardi Gras Indians in New Orleans and though their paths were unpredictable, many passed this area of the Tremé along their way. The first group he pointed out were the Creole Wild West, the city's oldest tribe, dating to the mid-1800s, and perhaps the most influential. A few minutes later, the Yellow Pocahontas, Big Chief Fi-Yi-Yi and the Mandingo Warriors, and the Mohawk Hunters were competing for recognition as to “who was the prettiest” with their spectacular, elaborately adorned, feathered and hand-sewn beaded suits as they ceremoniously met and danced with other tribes. Their intricate suits rank among the nation’s best folk art. 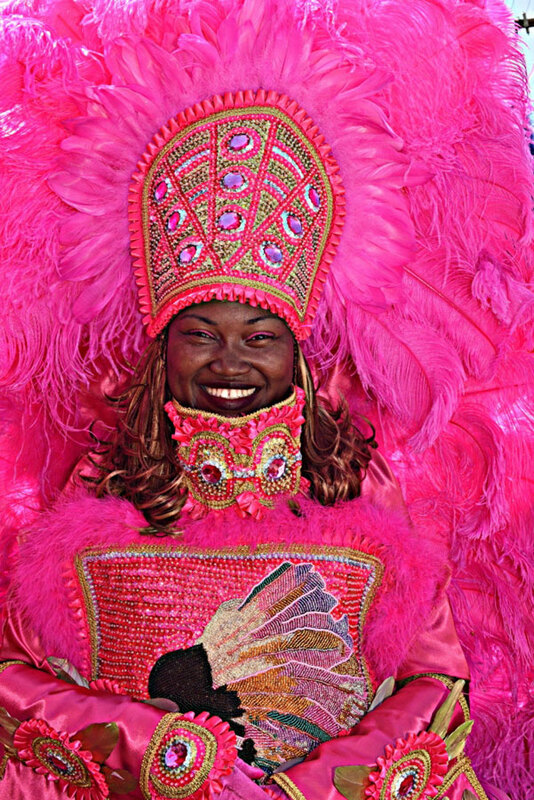 Worn for the first time on Fat Tuesday or Carnival Day, they are painstakingly made with thousands of beads, brightly dyed ostrich plumes, sequins, velvet, and rhinestones. Each costume takes all year to create and weighs up to 150 pounds, not to mention the expense. Their headdresses or “crowns” are simply amazing! There were also grown women dressed as “baby dolls” with frilly satin dresses, pacifiers, and bottles! We heard African drumming, call and response chanting, and saw men on stilts in African attire and locals celebrating Mardi Gras in an entirely different way. The next day, my curiosity led me to research and discover a culture that truly represents the history of New Orleans. Meanwhile, back in the area now known as the French Quarter, traditional African culture was kept alive in Congo Square, now located within Louis Armstrong Park on Rampart Street. The French and Spanish who ran Louisiana at the time were Catholics who believed it was a sin to work on Sunday. Thus, on Sundays the enslaved Africans were allowed to gather in the public square, sing traditional folk songs, play drums, and dance in a lively celebration. This was the only place in America where Africans who had been stolen from their homeland were able to practice their traditional culture and preserve their heritage. Before slavery was outlawed in the United States in 1863 and for some time after, New Orleans’ African-American residents were excluded from participating in official Mardi Gras celebrations. Historical records suggest that blacks were dressing up as Indians to celebrate Mardi Gras as early as 1746 in the black neighborhoods around Congo Square. They at least “masked Indian” until the nearby 1811 uprising that became America’s largest slave revolt led to a complete ban on all gatherings by people of color, regardless of whether they were enslaved or free men. 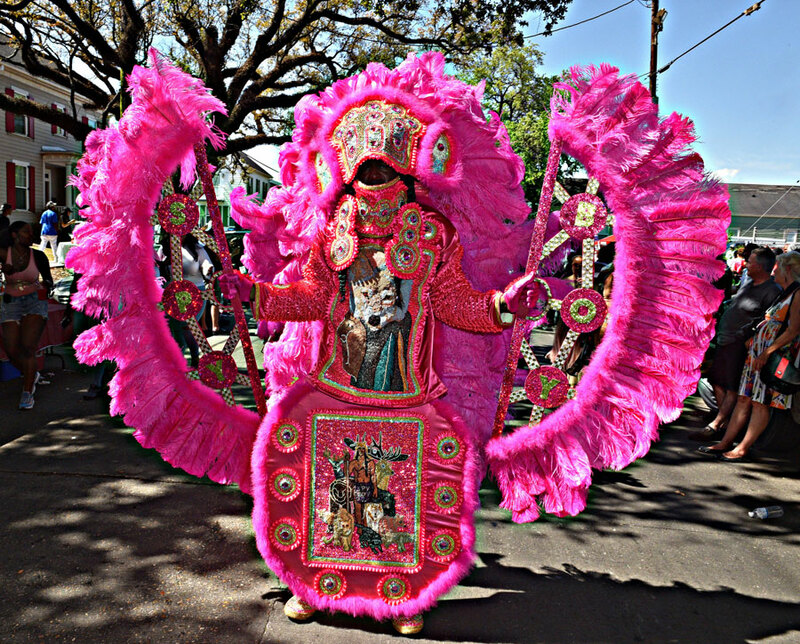 Ostracized by the white New Orleans Carnival krewes, the black Mardi Gras Indians found a way to celebrate the holiday in their own way, in their own communities, by taking to the streets donned with feathered “suits" or outfits, and “crowns” or headdresses, and chanting songs relevant to their lives. In early decades, the Indians used what they had to create their suits. They would find bangles from discarded dresses or mismatched earrings to make their suits sparkle and ring along with their tambourines. Early on the morning of Fat Tuesday, the Big Chief emerges from his home and marches behind his tribe, with a "Spyboy" who is a block or two ahead. The “Spyboy” motions to the "Flagboy" if the road ahead is clear and the "Flagboy" then alerts the Chief. Based on this, the Chief makes the decision as to what road to take. When two tribes meet each other on the same path, they have a battle which no longer involves bloodshed and weapons, but chanting and dancing, as well as an informal competition as to which Chief has the "prettiest" suit. These days, it takes the Mardi Gras Indians all year to create these works of art which, by those thirty to forty tribes that hold to tradition, are only worn for one year beginning on Mardi Gras Day, again on St. Joseph's night, for the Super Sunday parade of many tribes in March, Jazz Fest, and perhaps a few other occasions such as Indian funerals. 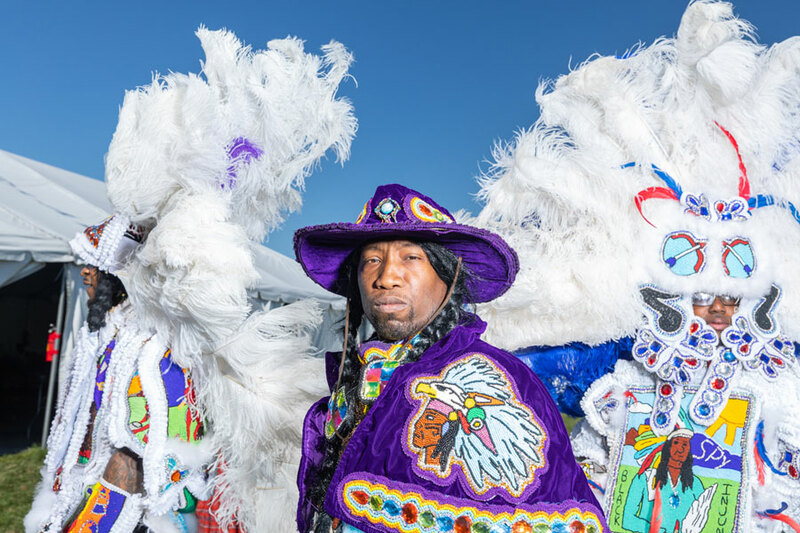 As the song by Big Chief Bo Dollis and his Wild Magnolias goes, “Every year at Carnival time, we make a new suit...” The Mardi Gras Indians continue to carry on the cultural traditions because of their strong community and family ties.